The length of a nymph dropper should be determined by where the fish are feeding in the water column. 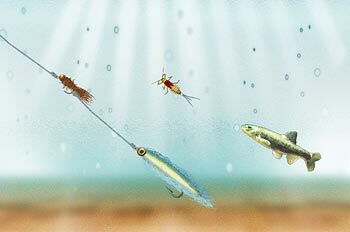 If trout are taking nymphs right below the surface, a 6-inch dropper will put the fly in the right zone. Earlier in the hatch, before there are many duns on the water, an 18-inch dropper may take more fish. If you want the fly right near the bottom, a 30-inch dropper will do the trick in shallow water. 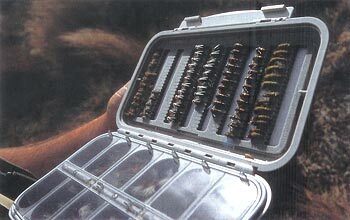 ALTHOUGH MULTI-FLY RIGS have been around for centuries and have always remained popular in Europe, fishing more than one pattern was nearly a forgotten science in this country until about 15 years ago. In fact, even when angling magazines flooded the market with tandem-rig stories, many anglers outside the Rockies took a long time to catch on. For instance, my older brother, Brian, has been fly fishing since the late 1970s, but he had never fished two flies until we traveled to Wyoming last summer. Troll a few Internet message boards, and you’ll find that a large portion of the fly-fishing community is still discovering the effectiveness of this “modern” technique. A tandem rig featuring a nymph on top and a streamer on the bottom imitates a baitfish feeding on emerging nymphs. Oftentimes, a large trout that isn’t interested in the nymph will take the opportunity to whack the baitfish imitation. Several years ago, a Green River guide showed me a slick way to tie the clinch knot in the leader material first and then slide the loop onto the hook. 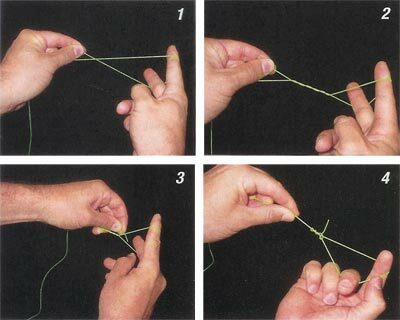 (See instructions on tying an Easy Dropper Loop at the bottom of this article.) 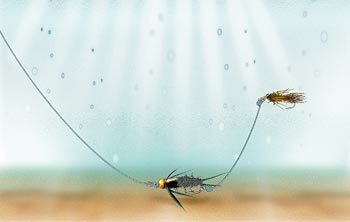 If you’re familiar with the water you’ll be fishing — and therefore understand what kinds of tandem rigs you’ll need — you can tie the two flies together at home and carry the complete rigs rolled up in old film canisters (for a dry and a nymph) or leader envelopes (for two nymphs). Then all you’ve got to do is tie on the top fly, and you’re in business. A good friend and serious angler likes to use the combination of a bead-head stonefly imitation and a buoyant mayfly pattern. He reasons that “swimmer” nymphs, such as blue-winged olives andIsonychia, that get knocked into the drift will wriggle their way back to the bottom as fast as they can and trout must be conditioned to eat these nymphs before they can reach safety. 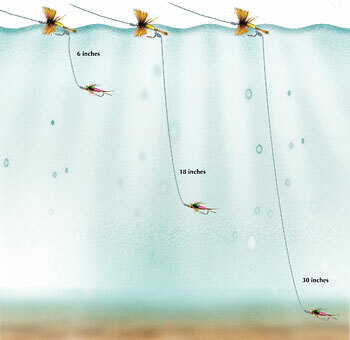 The bead-head fly gets the rig down to the bottom, and the buoyant fly drifts above it. By twitching the rod tip, my friend makes the second fly dive toward the bottom like a panicked natural. This is a great setup to use in a slow pool below a riffle.